NEW BEDFORD, Mass. 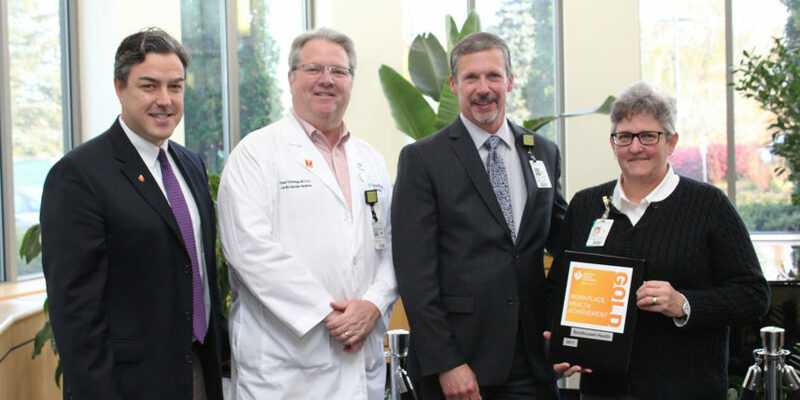 — Southcoast Health announced today that it has achieved Gold level recognition from the American Heart Association Workplace Health Achievement Index for taking significant steps to build a culture of health in the workplace. “We are very proud and honored to be recognized as a leader in workplace health promotion. This is a true testament to the effectiveness of our employee wellbeing program, HealthQuest, to the wellness committee and leadership, who actively support and promote it, and to our employees who engage and participate in it,” said Kris Aimone, Wellness Coordinator at Southcoast Health. The American Heart Association created the Index with its CEO Roundtable members, a leadership collaborative of more than 30 CEOs from some of America’s largest companies who are committed to applying evidence-based approaches to improve their employees’ overall health. The Index uses science-based best practices to evaluate the overall quality and comprehensiveness of their workplace health programs. A unique feature of the Index is that it calculates an average heart health score for employees of participating companies that securely submit aggregate health data. More than 800 companies completed the Index assessment this year and, of those companies, 67 percent received either Gold, Silver, or Bronze recognition. Companies receive benchmarking reports, which allow them to identify potential areas of improvement so that they can advance their annual performance and recognition. The Association’s Workplace Health Achievement Index allows companies to measure the effectiveness of their workplace health programs, as well as the overall heart health of their employees. Unlike other existing organizational scorecards, the Index also scores companies on the heart health of their employees based on Life’s Simple 7 – the Association’s scientifically validated definition of ideal heart health. The American Heart Association’s Workplace Health Achievement Index assessment is grounded in data-driven science, and a quality improvement framework. According to the Nielsen 2016 Employee Health Survey, robust and comprehensive strategies for well-being are associated with positive impacts on employees’ health. For more information, visit http://www.heart.org/HEARTORG/HealthyLiving/WorkplaceHealth/EmployerResources/Workplace-Health-Achievement-Index-Recognition-Awards_UCM_480944_Article.jsp#.WfKDed-Wy72.